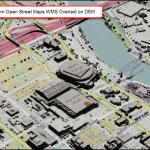 Author Archive for: "Applied Imagery"
An overview of photogrammetric UAS (drone) systems and how QT Modeler is used in the workflow. First in a 3-part series. Second tutorial in a 3-part UAS series. This video covers QA/QC , georegistration, point cloud cleanup, and DEM/DSM creation. Quick overview of QT Modeler markers - objects that represent a single point in 3D space. This overview shows how to create, edit, move, export, and alter the appearance of markers.